As an expectant mom, I have noticed a trend lately of dressing your child to match your outfit, particularly among mothers and daughters. As a general rule, I’m not sure how I feel about this trend. I feel like it’s the sort of thing that my child will look back on and hate. But at the same time, I can’t help but love the idea of coordinating a few things, at least if I can do it without being too matchy-matchy. 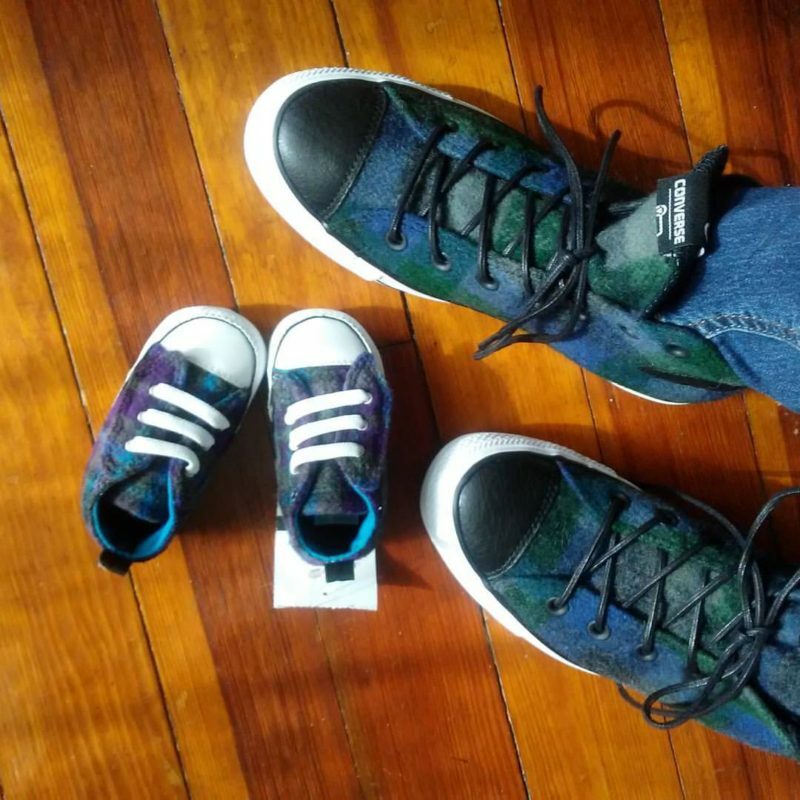 I recently found an adorable pair of baby converse (infant size 3) which should fit Spot this fall. And thanks to Burlington, they cost almost nothing, so she had to have them. Of course, that also meant that I had to visit the converse website and look for a matching pair. While they didn’t have any exact matches in adult sizes, I found a fabulous pair of Chuck Taylor Hi-Tops that coordinate wonderfully. 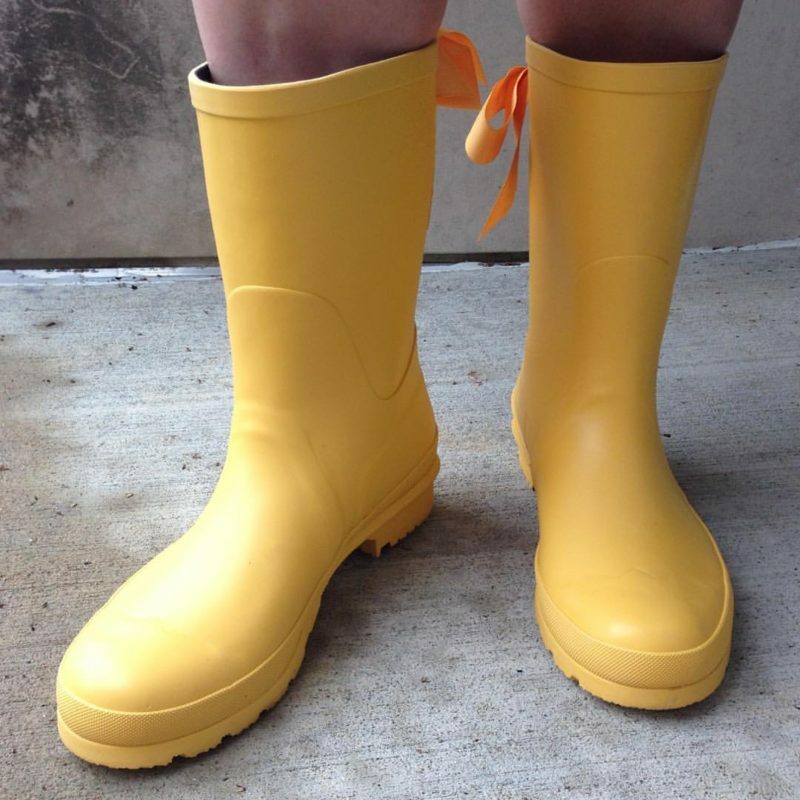 I even registered Spot for some cute little yellow rain boots. They aren’t quite so fancy, but I think they will still look cute with mine. But what I don’t quite understand are the full-on matching outfits. I will admit that there have been times I have seen a child’s outfit and thought “I wish that came in my size.” However, I’m at a complete loss to understand why you would want to look EXACTLY like your child. Heck, this trend will probably grow on me, but let’s hope that my husband keeping me from doing anything that will embarrass Spot later in life. How do you feel about the Mommy & Me outfit trend? Next → Next post: Bookish Questions – Favorite Cover Art? Nothing new under the sun; Mommy and Me outfits first started in the 1950s. There are photos of celebs of the day such as Joan Crawford and her daughter with matching outfits. I was born in 1962 and came in on the tail-end of that. It’s “cuter” (I guess) when the child is still a toddler. I think being dressed like my sister as a child is one of the main reasons that I don’t love the idea of “mommy and me” outfits. My sister was 4 years younger than me, and I think she liked getting to wear the same thing as me, but I certainly didn’t like it. Yeah, my sister was 3 yrs older than me and I knew I’d get stuck with the same dress in the same fabric but used. Ugh. I hate hand-me-downs to this day. At least I never got stuck with second-hand shoes, as she was wearing size 9 women’s shoes by the time she was 10; I still wear sevens. I like hand-me-downs, but it’s probably different for me. As the oldest, I passed them down for a long time, but then I got to a point where my sisters were bigger than I was, and so I got what could actually be termed as hand-me-ups. And since we were older at the time and my family has good taste in clothes, I usually got pretty lucky with the whole situation.